A hilarious tale of dogs, fogs, bogs and moving to Ireland. For many years, Nick and Lesley Albert had shared a dream of living far away from the stress of modern life, and when the opportunity arose, they jumped in with both feet. Almost overnight, they decided to move to beautiful County Clare, in the west of Ireland – a Country they had never before visited. With little experience or money they set about renovating a derelict farmhouse and building a new life together - hindered only by their lack of skill, twenty-two chickens ,two ducks and several unruly dogs. Bursting with comical anecdotes and witty observations, blended with occasional moments of exquisite sadness, this is a delightful true story of an English couple searching for a new life in the quiet solitude of rural Ireland. "Marley and Me" meets "Round Ireland with a Fridge." 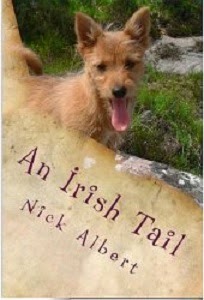 If you love dogs, Ireland and life, then you will adore “An Irish Tail”.